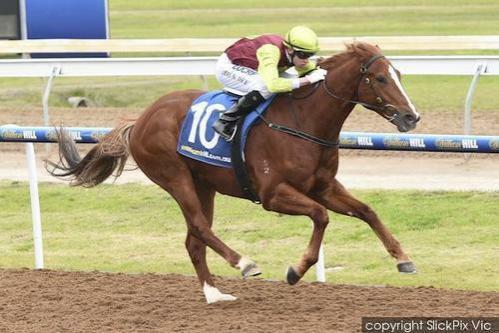 After a pass mark on debut, the striking two-year-old colt Bon Aurum (Bon Hoffa X Goldsmobile) bounced back in the best possible way against some older horses at Geelong on Tuesday. Michael Dee made perfect use of barrier two and allowed his mount to lead basically from start to finish. Bon Aurum jumped nicely, found the lead effortlessly, and the rest of the race was a perfect display of balance, momentum as well as natural talent. The colt was going very easily in the lead for the entire race, and when asked, the son of the great sprinter / miler Bon Hoffa really lengthened and extended his lead when asked by Michael. With the two-year-old weight of 56kg, Bon Aurum was able to steal a break early in the straight and Michael rightly kept the colt going all the way to the line as to educate him heading towards bigger and better things in the future. This colt only has a month or so left of being a two-year-old, but with the improvement he has shown from his first trial, to his debut, and then to this win on Tuesday, there is no reason he won’t continue to improve heading into his Classic season. Ciaron is doing quite well with the progeny of Bon Hoffa having as we speak, a 50% strike rate with the sons and daughters of the Group 1 winner and Bon Aurum looks to indeed have a nice future ahead. He really has turned the corner and once the penny drops with these types of colts, then generally continue to improve. The professionalism the colt showed on Tuesday is indicative of a colt that is learning his trade well. Well done also to Michael Dee on another winner for the stable. Michael is riding in tremendous form and he gave Bon Aurum every chance on Tuesday, which is exactly what the stable asked of him. The colt's dam Goldsmobile has had three to race for three winners and we are currently syndicating a yearling by Domesday, this colts half brother to be trained by Ciaron Maher at the moment. He's at the breakers and looks a likely type. This is a family on the move!